Runil is an Altmer priest of Arkay, and the keeper of Falkreath's Hall of the Dead. Although he may be in charge of taking care of Falkreath's shrine to Arkay, Runil actually lives a fairly relaxed lifestyle. He wakes up at 5am and makes his way out of the Hall of the Dead to head to the local inn, Dead Man's Drink. He will spend his time here sitting, drinking, and socializing with the other regulars that come in throughout the day. He leaves the inn at 8pm to return to the Hall of the Dead. He will sweep the floor and otherwise relax inside the building until he goes to bed at midnight. The only exception to this schedule is when he conducts Lavinia's last rites ceremony which happens when you first enter Falkreath. He wears monk robes and a pair of boots. He is equipped with an iron dagger, and carries a key to the Hall of the Dead, as well as a selection of lower class items and gold. When Runil is asked if he tends the graveyard alone, he will laugh, "Oh, merciful Arkay, no! I am too old and frail, and this graveyard is too large. Kust is my assistant. He helps me tend the headstones and keep our cemetery clean, as befits a place of rest." He will often tell you of his and Kust's duties, saying, "Kust is responsible for the cemetery here in Falkreath, I take care of the Shrine." 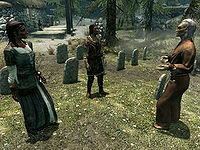 Runil will also mention Falkreath's cemetery, saying either of the following lines: "War is not new to Falkreath. You have only to stand in our cemetery to see that" or "The number of graves in this cemetery never decreases." Runil will often preach to you, "Without birth there is no life, without death there is only stasis. Such is the truth of Arkay." Runil displays his opinion on the ruling body of Falkreath by stating, "Dengeir deserves more respect than his nephew, Jarl Siddgeir, affords him." When asked for Conjuration training, he will caution you with, "I'll teach you some of what I know, but be careful." When parting from dialogue he will often say, "Life is far too short my friend, don't waste it!" or "We'll all meet Arkay sooner or later. Best to enjoy the time we've got." 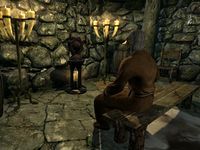 In his journal he mentions that he is trying to avoid the Thalmor in Skyrim: "I have heard that they [the Thalmor] and their agents are abroad in Skyrim, rooting out worshippers of Talos. I must be sure to keep a low profile." You may be asked by Thadgeir to deliver the ashes of Berit, his war companion, to Runil, "who'll know the right blessings for Berit's soul." When you give the ashes to Runil, he will respond, "Ah, Berit's ashes. He was a good man. Not many warriors grow to a fine, old age." and continue, "Thank you for bringing this to me. I'll make sure he gets his rites. Here, for your trouble." Skaal Village DialogueDB: Take Bera's necklace to Runil in Falkreath. "...and may we one day rejoin them in eternity"
"I came into Arkay's light after the Great War." 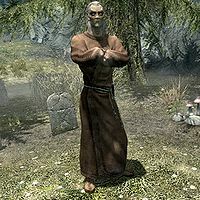 When you first visit Falkreath, he will be seen preaching to Mathies and Indara Caerellia in the graveyard, saying: "The god Arkay was once like us, bound to winding mortality. But he willingly gave up this existence that we might better understand the vagaries of life and death. It is through the ebb and flow of this cosmic tide that we find renewal and, in the end, peace. May the spirit of Lavinia and all those who have left this world and its suffering know the beloved serenity of Aetherius...and may we one day rejoin them in eternity." This dialogue refers to the Caerellia's recently deceased daughter, Lavinia, who was murdered by Sinding. When asked if he is a priest, Runil will reply, "I am. I came into Arkay's light after the Great War. So many died by my hands, my magics. I'm fortunate that Kust and the people of Falkreath have come to accept me as one of their own. Could you do an old elf a favor? I misplaced my journal in a cave I was exploring. I'll pay for its return." Accepting the task will cause Runil to say, "Blessing of Arkay to you for your help." and the quest will be added to your journal, while refusing will cause him to sigh, "Very well." When exiting dialogue after receiving this quest, he will say, "That journal means a lot to me, if you find it." Once you have retrieved his journal, go to him and return it. After you do this, he will say, "Thank you. It's a collection of regrets that I try not to forget. Here, I promised you this." and give you a leveled amount of gold. After having accepted Morwen's quest, and having received her mother's necklace, you must tell him that Morwen sent you, to which he will reply, "Morwen, you say? Now there's a name I haven't heard in a long time. Left to join her mother's people on Solstheim, as I recall. I knew her parents quite well, you know. Bera and Ulfarr were good people, very much in love. Now, what can I do for young Morwen?" You may then tell him that she is not very young anymore, and he will reply jokingly, "Ah, well, I suppose she'll always be that fiesty [sic] little girl I used to know. Of course, when you reach my age, you'll find that the word 'young' is a very relative term." To finish the quest, tell him that she wants the amulet to be placed on her mother's grave, and he will say pleasantly, "Ah yes, Bera's silver necklace. It was a wedding gift and she rarely took it off. I'll be glad to oblige. What a touching gesture, to display the symbol of her devotion in such a way. Tell Morwen I'll be happy to grant her request. I am sure it will bring joy to her mother and father as they walk in Aetherius." He will then take the necklace and allow you to return to Morwen. Runil's journal reveals that he had a prophetic dream of the return of dragons and the Dovahkiin. The journal also suggests that Runil fought in the Great War on the side of the Aldmeri Dominion as a leader of a unit of battlemages. Game data indicates an unused quest for Runil called Runil's Dark Past, where Runil's friends would have asked you to talk to Runil. You would have informed him, "Some of your friends feel you're troubled. ", and he would have replied, "Burying the past is much harder than burying remains. I'm... I'm afraid of what you will think of me if I tell you about the things I've done." Should you tell him, he will go on, "Although I have not practiced in a long time I was once a wizard. Even when I was young my magic was undeniably powerful. It was that power that brought me to the attention of the Thalmor. In the Summerset Isles it is a great honor to be chosen to serve the Thalmor." Runil will also explain who the Thalmor are: "They are the governing council of the Aldmeri Dominion. They lead us to attack the Empire and forced the Empire to agree to stop worshiping Talos. It was during the war with the Empire that I was at the height of my power. As a Thalmor battlemage I laid waste the enemy. Men, women, children, no one was spared my wrath. I destroyed whole villages." He will confirm that he is afraid his friends will find out. "I dream about those days still. Except I'm not me. I can see myself there and I try to stop what I know is going to happen but... Many of the Empire's troops were Nords at that point. Some of them could even have been from around here." After this conversation, you could have told Runil that his secret is safe with you, and he would have been grateful: "Thank you. May Arkay bless you. I won't forget this." Alternatively, you could have told either Indara, Mathies, or Kust that Runil was one of the Thalmor during the war, and they would have replied, "I knew he was troubled, but one of the Thalmor? I wish I could say I did not believe it. Thank you for telling me." Runil may lose the dialogue option for his version of the Delivery quest if you complete his version of Dungeon Delving first.